The tornado in Oklahoma has had a devastating effect and Close To My Heart wants to help. 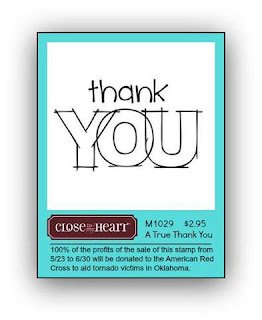 To aid relief efforts, Close To My Heart is making a new Autumn/Winter 2013 stamp set, A True Thank You ($2.95 retail), available immediately and will donate 100% of the profits from sales of the set from May 23 through June 30 to the American Red Cross. The ABC's Everything letter "J"